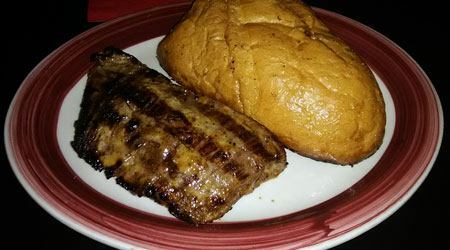 All steaks and kabobs offered come with a large slice of our house-prepared garlic bread. Sirloin with a side of bread. A great meal if you want it, 8oz. The filet you’ve read about; grill it up and be happy, 8oz. It’s a ribeye… Delmonico style! 16oz. Marinated in mustard, garlic, soy sauce, lemon juice and other seasonings, 10oz. Drenched in beer and soy sauce, seasoned with citrus, garlic, and onions, 10oz. Seasoned with olive oil, vinegar, garlic, onion and bell peppers, 8oz. We proudly serve a 7oz hand-pressed 100% ground chuck burger patty on a large fresh bun with lettuce, tomato, white onion and a slice of our favorite cheddar. A fresh, 6oz skinless breast marinated in teriyaki sauce and served with a large fresh bun, lettuce, tomato, white onion, and a slice of provolone. Seasoned with Italian dressing, provolone, fresh pesto sauce, a large fresh bun with lettuce, tomato, and white onion. Two skewers with red potatoes, red, yellow and green bell peppers, white onion and white mushrooms all brushed with Italian seasonings. bell peppers. Beef: 8oz • Chicken: 6oz. Two marinated skewers with white onion, red, yellow and green bell peppers, 6oz. A single teriyaki salmon kabob and our famous 8oz sirloin steak. We suggest the ol’ touch test when grilling steaks and burgers. A rare steak or burger will feel like your cheek, medium rare like your chin, medium like the tip of your nose, and well done like the bottom of your shoe. Choice of Buttermilk Ranch, Bleu Cheese or Italian dressing. Served with a fresh hot dog bun. Ask about our assortment of cheesecakes from The Incredible Cheesecake Company. Caution: Consuming raw or undercooked meat, poultry or seafood may increase your risk of foodborne illnesses, especially if you have certain medical problems.